Polytronics Technology Corp. (PTTC) manufactures Thermal Management Products and Thermally Conductive Boards (TCB) for the LED markets, lighting markets, backlighting markets, power markets, automotive, motor controls, solar cells and motherboards. Polytronics Technology is here to help solve all of your modern electronic heat dissipation needs. 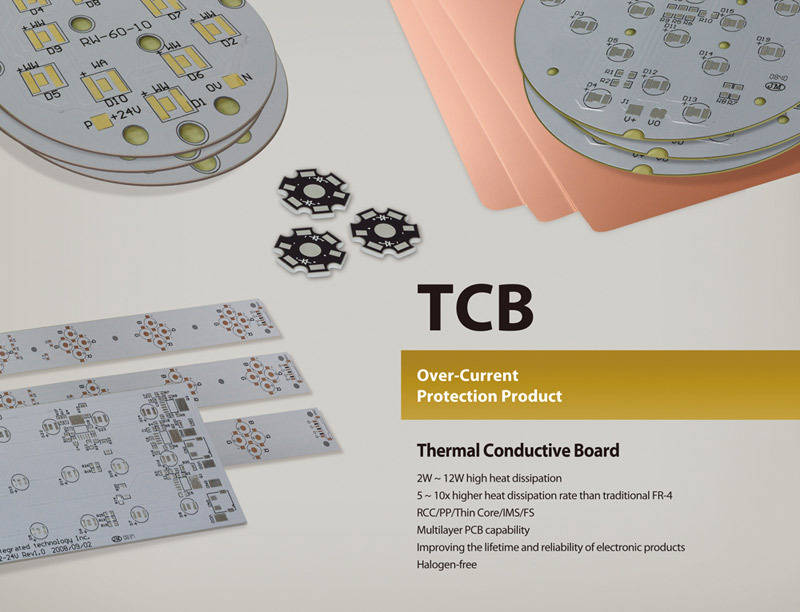 Thermally Conductive Board (TCB), an Insulated Metal Substrate, provides the advantages of high thermal conductivity, reliability, and solder heat endurance. The TCB substrate is a sandwich structure, which includes a layer of copper for conductors, a unique polymer composite and a base layer for heat dissipation. The thermal conductivity of TCB boards is up to 20 times higher than the traditional epoxy filled glass fiber system.